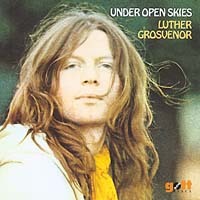 Under Open Skies is a very strong album by Island recording artist Luther Grosvenor, who left Spooky Tooth and joined Mott The Hoople after that group left Island for CBS. Originally released on the Island and Demon/Edsel labels and now on Gottdiscs with new notes and slipcase for 2004. Featuring Jim Capaldi of Traffic and the man Luther Grosvenor replaced in Mott The Hoople, Mick Ralphs.